Kentucky waterfowl seasons for both ducks and geese open Thanksgiving Day statewide. Duck numbers are at all time highs. They will provide excellent hunting opportunity this season as will the burgeoning population of Canada goose in Kentucky. The holiday commercials already swamping our collective brains along with winds straight from the North Pole remind us that short-sleeve weather is now months away. Winter is here. Waterfowl hunters don’t see these developments as bad news. They are getting their bags of decoys out of storage, cleaning and oiling shotguns and practicing their calling. Waterfowl season, for both ducks and geese, opens Thanksgiving Day, Nov. 27. Waterfowl habitat across Kentucky is in good shape and the recent cold snap shouldn’t greatly impact the upcoming opener. “It is dried out a little bit, we could use some more rain, but everything still looks good,” said Rocky Pritchert, migratory bird program coordinator for the Kentucky Department of Fish and Wildlife Resources. Hunters are reminded of some changes to waterfowl hunting regulations for the 2015-2016 waterfowl seasons. Canada goose hunters in the Northeastern Goose Zone now have an additional 10 days to hunt with the season opening Dec. 20, 2014 and closing Jan. 31, 2015. Waterfowlers hunting Kentucky River Wildlife Management Area (WMA) in Owen and Henry counties, including the newly acquired Boone Tract, must cease hunting at 2 p.m. Hunters using the Powell’s Lake Unit of Sloughs WMA may now conduct walk-in hunting during the upcoming waterfowl seasons. Duck numbers continue to increase with excellent reproduction over the last year. The total duck population numbers released by the U.S. Fish and Wildlife Service show a record 49.2 million ducks, an 8 percent increase over last year and a 43 percent increase over the long term average from 1955 to 2013. Mallards again are the most numerous duck species with 10.9 million birds in the population, an increase of 5 percent from last year. Farm ponds and small lakes are great spots for early season duck hunting. These habitat types don’t require a hunter own dozens of decoys, a boat or other expensive equipment. A few decoys, a pile of brush to crouch behind and an affordable pump shotgun put ducks in the bag. A small pond of an acre or less or a deep, slow pool of a creek often requires no decoy spread at all. Hunters can find great shooting with the first arriving ducks in the morning with not a decoy in sight. Be sure and scout potential waters for duck use before the season. The resident population of Canada goose is roughly 40,000 birds and along with an increasing number of migrating birds should provide ample opportunity. Pritchert said ideal weather for goose hunting is cold weather to the north of Kentucky with weather here warm enough to keep water from freezing. “For goose hunting, a good snow line that comes down and barely touches the Ohio River tends to push a lot of geese down this way for a period of 10 to 14 days,” he said. The general areas around power plants along the Ohio River are Canada goose hunting hot spots. 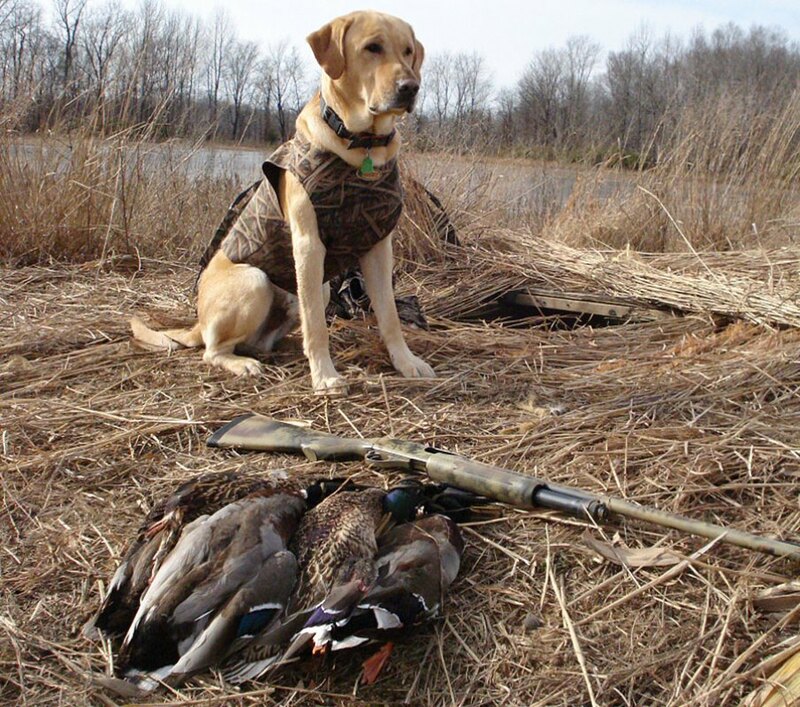 You’ll need a valid Kentucky hunting license, Kentucky migratory game bird-waterfowl permit and a federal waterfowl permit, commonly called a duck stamp, for waterfowl hunting. For more information on waterfowl hunting regulations, areas to hunt or other information, consult a copy of the 2014-2015 Kentucky Hunting Guide for Waterfowl, available free wherever hunting licenses are sold. You may print a copy from the Kentucky Fish and Wildlife website at fw.ky.gov or request one by calling 1-800-858-1549.